India may adopt a contactless fare card, similar to the Octopus card in Hong Kong, to pay for transit trips. Photo by Pawel Loj. Such cards, over time, would rid passengers of the need to buy tickets for mass transit, including buses, trains, rail, metro, ferry, taxis and even autorickshaws. Air travel is virtually the only form of travel that will be excluded. India’s work on the single ticketing system began a year ago with the goal of rolling out the system in major cities and eventually linking up the “one card” system across the country. UTITSL, a government agency of the Reserve Bank of India, is working to develop the automatic fare collection and single card payment method. A major bottleneck to speedy transport in India is the “lack of seamless connectivity, particularly ticket integration,” according to UTITSL. The designers of the plan hope single ticketing ameliorates some of the concerns. Mobile phone payments will also be a near-future option for transit users in India. Installing chips in phones that link to bank accounts could pay for a variety of services, as TheCityFix wrote about in detail. Whatever the technology, a few things are clear: contact-less payment that links directly to an account eliminates the need for cash and buying tickets, minimizes handling costs for transit operators, speeds up the on-boarding and off-boarding process, and eliminates the evasion of fares on such transit systems. The cities chosen for the new system in India are Delhi, Bangalore, Jaipur, Bhopal, Indore and Mumbai—all large cities with varying forms of transit. But there are already a number of major cities that have the single card system in place: Hong Kong, Singapore, Beijing, Istanbul, Seattle, San Francisco, Stockholm, Gothenburg, Kuala Lumpur, Rome and others. In Seattle, 200,000 passengers use the ORCA card which has benefitted transit agencies and users with the efficiencies mentioned above, but there have been some drawbacks. Some drivers don’t understand key features of the card, the $5 one-time purchasing fee can be a drawback for low income users, and riders must activate the card within 60 days of adding money. 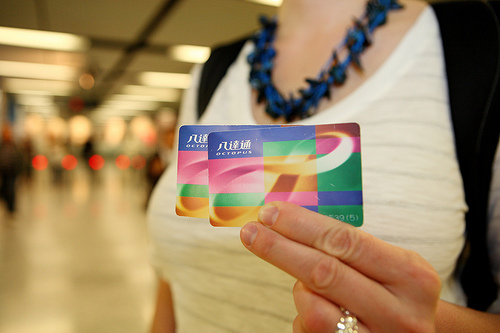 In Hong Kong, the common card system is the aptly named “Octopus card.” The card pays for Hong Kong’s many modes of public transit, as well as convenience store purchases and virtually every other imaginable good and service. The cards are used by an astounding 95 percent of the population (elderly included) in the city despite the initial cost of about $6 to buy the card. India is thinking of making its “common transport card” nearly as ubiquitous as Hong Kong’s with the option of using it for highway taxes, utilities, car parking and shopping. But the first steps are to successfully educate users in the select start-up cities and, of course, installing the card readers on vehicles, railway platforms and bus stations. As the plans continues to roll out, the ministry will “hold a nationwide competition on the design of the cards, their logo and their final name.” If you’re a designer or software engineer that wants to potentially reach a billion people, India is looking to some technological breakthroughs.